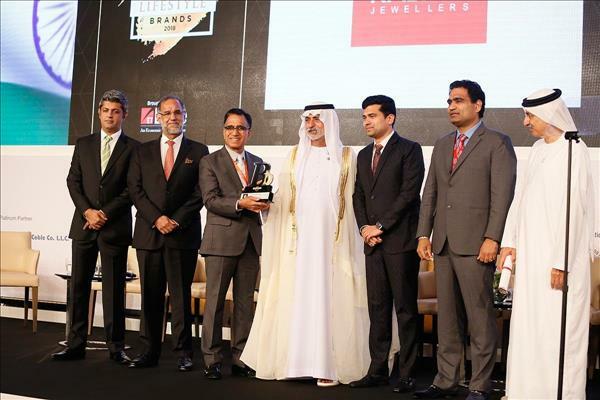 (MENAFN - ForPressRelease) Kalyan Jewellers, one of the most trusted and leading jewellery brands in the GCC and India has won the Lifestyle Brand Of The Year Award 2018 at the Economic Times India-UAE Strategic Conclave. The award was presented by His Excellency, Sheikh Nahyan bin Mabarak Al Nahyan, Cabinet Member and Minister of Tolerance, to Kalyan Jewellers Chairman and Managing Director T.S. Kalyanaraman along with Executive Directors Rajesh Kalyanaraman and Ramesh Kalyanaraman. His Excellency, Navdeep Singh Suri, Ambassador of India in the UAE was also present on the dais when the award was being conferred. T.S. Kalyanaraman, Chairman and Managing Director of Kalyan Jewellers said, It is very humbling to have received such as award from His Excellency, Sheikh Nahyan bin Mabarak Al Nahyan and this award is dedicated to all our customers and our team who have contributed to the unprecedented growth of brand Kalyan Jewellers. At a time when both the UAE and India are forging their relationships on economic, community and social fronts, we at Kalyan Jewellers are proud to be a part of this strategic corridor, contributing to the strong bonds that have existed historically. Kalyan Jewellers presence in the region and the continuous efforts to invest more and more in the UAE underscores our commitment, added Mr. Kalyanaraman. Kalyan Jewellers was established in India in 1993 and is one of Indias largest jewellery brands by revenues. It has established benchmarks in innovation, quality and customer service. The company forayed into GCC in 2013 with a power packed, multi-showroom launch in UAE and currently has 18 showrooms in the country. This was followed by markets like Kuwait (four showrooms) and Qatar (seven showrooms), Oman (three stores) and today Kalyan has a network of 33 showrooms across these four countries. The company was the first to attract the largest private equity investment in the Indian jewellery sector by Warburg Pincus of USD 200 million.